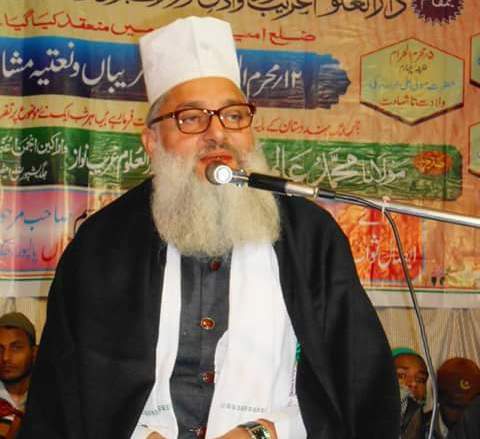 All India Ulema Mashaikh Board, the body that promotes sufism, has urged the clergy to expose the ideologies of Islamic State during their Friday sermons as part of an initiative to prevent people from falling into the trap of the dreaded terror outfit. To begin with, the clerics associated with the board will base their sermon son Q ur a ni ct ea ching sand hadiths (Prophet’s traditions) to showcase the IS ideology was nothing but sham. Prominent sufi leader and president of the board Syed Mohammad Ashraf Kichochawi said: “Time is high that we expose these terror outfits in the larger interest of humanity. ISIS kills in name of Islam and followers of Islam are expected to rise against them,” he said adding that acts of ISIS and its fighters fall under the category of Ashad Haram, which means severely forbidden in Islam. “Such a savage terror group using Quran and holy banners has no place in Muslim world,” he said. Syed Ashraf, who has been espousing a campaign against the ideology of terror groups, had organised ‘a million march’ in Moradabad in 2011 followed by an anti-terror rally attended by 7 lakh people in Rae Bareli in 2013. This time the board has targeted the clergy to denounce the ISIS and its ideology. “We are urging the clerics throughout the country to censure ISIS in their Friday sermons and religious gatherings. They should tell people any terror related activities are strongly forbidden in Islam. Their acts are based on mis interpretation of Islam and are largely aimed at serving their evil political agenda,” he said. The board, he said, was working with several other groups to unite the entire clergy and strategise to wipe off any influence ISIS has on anyone. “All of us need to look deep into how much wrong interpretation of political Islam has done to us,” he said. Friday Sermons in Indian Mosques Should Refute The Extremist Theology Of Violence And Xenophobia And Promote Positive, Pluralistic, Inclusive Values Of Islam? From countless stories we read emanating from the Muslim world, it is clear that extremist jihadists’ atrocities are putting Muslims’ life in great jeopardy. Their hate-driven interpretations of Islamic fundamentals and doctrines are acting as the root cause for the widespread growth of extremist movements in the name of Islam. It shocks us to see how cunningly the extremist political Islamists join hands with the powerful nations in the world to serve their imperialist designs. It’s not difficult to see why the extremist outfits such as Daesh, al-Shabab and Boko Haram are hell-bent on capturing mosques and vandalising historical heritage which represents Muslims’ peaceful coexistence with other communities and cultures. In this context, it is quite relevant to know what the moderate, peace-loving and spiritually inclined Islamic clerics and imams are doing to tackle this global threat. Recently, the Indian Sunni-Sufi cleric, Syed Muhammad Ashraf Kichhochhawi, founder-president of All India Ulama Mashaikh Board urged the Muslim preachers and clerics, most notably the imams of mosques, to rebut the extremists’ understanding of Islam in their Friday sermons. Speaking from a jurisprudential perspective of Islam, he stated: “The acts of terror perpetrated by the extremist jihadists of the ISIS fall into the category ofashad haram (severely forbidden in Islam). The terror outfits such as ISIS are shedding blood of innocent civilians loudly proclaiming to be ‘Islamists’ and chanting “Allahu Akbar” (Allah is the great). Obviously, this has defamed Islam, the religion of peace and tranquillity”. Thus, Syed Muhammad Ashraf, in his recent statement published in Urdu daily Inquilab, appealed to the imams of mosques to categorically denounce and refute the terrorist ideologies in their Friday sermons and other religious talks. In view of the vital significance of Friday sermons and other khutbas (special religious talks) delivered in mosques, the above statement certainly assumes paramount importance. As a matter of fact, mosques and Islamic religious sermons (khutbas) have been misused by the hate preachers for vested interests and political ends. Therefore, this initiative should have long been taken in India, just as it has happened recently in North African Muslim countries, particularly in Egypt, Syria, Iraq and Morocco. Against the backdrop of radical Takfirist sermons echoing in the mosques in the Middle East, this sagacious step has been taken in mosques so that common Muslims could be saved from hate-mongering in the religious domain. Regrettably, majority of our mosques all over the world seem to be captured by hardliners and less progressive Muslims. Having the great consideration for the noble position of an Imam, one would question how many of our imams the world over, strongly and clearly spoke against the extremists’ brazenly un-Islamic atrocities, except for a few moderates among them? Why do we not hear spirited, courageous and unequivocal words from this stratum of Muslim clergy on countering the extremist sermons? While it was their first and foremost duty to refute the hate-filled extremist sermons, they seem to be oblivious to this ground reality. In any case, Muslims cannot discredit the role of the Imams in educating the common Muslims about the peaceful postulates of Islam. They have been the most important communicators of the Qur’anic messages in mosques and society at large. They can play a pivotal role in the complete eradication of extremist ideology that continues to radicalise many in our society. At a time when the extremist sermons are delivered in certain mosques with an aim to serve the nefarious political agendas, moderate Imams and Islamic preachers across the world must unite and devise effective strategies to tackle with it. In fact, it’s time they seriously pondered over the radical interpretations of Islamic references that are damaging the gullible minds of Muslim youth. Most urgently, they need to restore the respect for mankind stressing essential humanitarian values in the minds of Muslim masses. In order to emphasise the need and significance of respect for mankind, they may relay numerous Prophetic sayings such as: “Those who are merciful will be shown mercy by the Merciful. Be merciful to those on the earth and the One above the heavens will have mercy upon you. The womb is derived from the Merciful, so whoever keeps relations with his family then Allah will keep relations with him, and whoever abandons his family then Allah will abandon him.” (Sunan At-Tirmidhi 1924). However, there should be no disparity between the Sunni and Shiite imams in their pronouncements against the religious extremism. The Daesh (ISIS) terrorists have killed dozens of Sunni imams who refused to swear allegiance to them, while, on the other hand, they slaughtered the Shia community indiscriminately. It is about time the imams told their followers that these terrorists are violating the tenets of both Sunni and Shiite schools of thought. They have to make it clear, unambiguously and unequivocally, that the nefarious version of faith espoused by the ISIL, ISISI, Boko Haram, Taliban, al-Qaida and other Takfiri terrorists is a renewed version of the Khariji-Wahhabi ideology, antithetical to the mainstream Islamic faith. Ironically, while the IS terrorists vehemently and openly reject all the four major and canonised Islamic jurisprudential schools, the media ignoramuses call them “Sunni terrorists”. It is indeed gratifying to see that both Shi’ite and Sunni Sufi leaders in India have jointly called for national unity to counter sectarian violence of these takfiri terrorists. Certainly, it will help the independent analysts understand that the dangerous radicals within Muslims are neither the Sunnis nor the Shiites, but rather a cult of the Wahhabi Takfirists. Undoubtedly, we cannot successfully eradicate the cancer of extremism from the Muslim world, unless we engage the imams of both Sunni and Shiite mosques in this gigantic task. They have an acute grip over the Muslim community and hence they can better prevent the Muslim youth from falling prey to the ideological misguidance. There can be no better and more influential actors than the imams who get exposed to the community members to redress religious issues of their concern. Therefore, they have to be trained by the expert Islamic scholars and intelligentsia to tackle the religious extremists who try to recruit innocent worshippers. To start with this task, they would better deliver Friday sermons backing law and order machinery of the country as much as our composite, inclusive culture, while speaking out against radicalisation. Besides educating the worshippers about the essential Islamic teachings and moral virtues, they should be addressing issues of moderation and extremism, national unity, social integrity, women’s rights, education system, youth issues, the rights of non-Muslims or even atheists and non-believers in an attempt to guide them on a right and moderate track. Most importantly, they should focus on societal reforms in their sermons urging the worshippers to avoid ideological extremism and uphold moderate views. Unfortunately, most imams in India come from weaker family and education backgrounds and are unequipped to tackle the current issues of national and global concern due to lack of the required skills and sophistication. But still, they may influence modern and educated Muslims with moderate thoughts based on the primary Islamic studies. They must incorporate in their sermons the guiding peaceful Qur’anic paradigms, pluralistic Prophetic traditions and harmonious jurisprudential injunctions in an attempt to transform the present-day intolerant mindsets into an inclusive Islamic bent of mind. In a word, they need a major overhaul of their sermon designs with an incorporation of the true moderate Islamic views. That can effectively run down the extremist thoughts in the Muslim religious domain. Addressing the mosques’ imams and Islamic clergy, he said: “we need to restore the respect for mankind instilling essential humanitarian values in the minds of people, particularly Muslim masses”. Stressing the need and significance of respect for mankind, Syed Muhammad Ashraf Kichhochhawi quoted a Prophetic saying: “Those who are merciful will be shown mercy by the Merciful. Be merciful to those on the earth and the One above the heavens will have mercy upon you. The womb is derived from the Merciful, so whoever keeps relations with his family then Allah will keep relations with him, and whoever abandons his family then Allah will abandon him.” (Sunan At-Tirmidhi 1924). Four months later, when Rajasthan’s desert winter has given way to the heat of June, the dargah will be filled with lamps. Its assembly hall, resounding with the sound of the qawwals’ harmoniums, will herald the 800th urs of Khwaja Moinuddin Chishti of Ajmer. Smaller groups of musicians will draw their own listeners within the various courtyards and sama (a gathering listening to mystical verse) music will echo in the streets. The terraces surrounding thedargah will come alive with their own qawwali gatherings and the last melodic strains will die only when the early morning prayer is called by the muezzin. “Moinuddin Chishti’s dwelling place became a nucleus for the Islamization of the central and southern parts of India,” noted the late Annemarie Schimmel, an expert on Islam, in her book Mystical Dimensions of Islam. South Asia’s most revered Muslim, Moinuddin Chishti occupies a principal position in Sufism, the mystical aspect of Islam. He established the Chishti silsila (order) in the subcontinent; its spiritual successors were Sufis like Khwaja Qutubuddin Bakhtiar Kaki of Mehrauli, Baba Farid of Pakpattan in Pakistan, and Hazrat Nizamuddin of Delhi. Known as Sultan-e-Hind and Gharib Nawaz, Khwaja Moinuddin Chishti—khwaja meaning “master” in Persian—is visited by millions each year. Since no contemporary account of him has survived, Moinuddin Chishti’s life is depicted through a series of legends. He died in 1236. 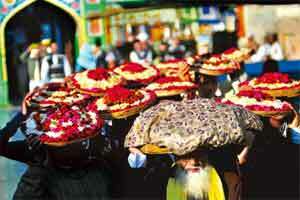 The death anniversary of a Sufi saint’s death is not mourned, it is celebrated. Urs means “wedding” in Arabic and it symbolizes the union of the lover with the beloved, who is God. “Ajmer is the little Medina,” says Sadia Dehlvi, author of Sufism: The Heart of Islam. “Sufism is about making linkages to God through his friends. In Medina, there is the spiritual presence of Prophet Muhammad. In Ajmer, one experiences the same closeness to God, for Khwaja sahib is a direct descendant and lover of the Prophet,” says Dehlvi. South Asia’s Islamic community is largely composed of the Barelvis and Deobandis, both named after towns in Uttar Pradesh. The former, who have their theological school in Bareilly, are followers of Sufism, while the orthodox jurists in Deoband are against the concept of intercession to God through saints. In November, Deoband passed afatwa against celebrating the Prophet’s birthday, calling it un-Islamic, an occasion traditionally held with great fanfare in Ajmer and other dargahs. “Sometimes even Deobandis come here to seek the Khwaja’s blessing,” says Syed Anwar-ul-Haq Chishti, an elderly khadim sitting cross-legged in the Ajmer dargah. A long queue is forming for the sunset ceremony of Dua-e-Roshni (prayer of lights). Each evening as khadims carry large yellow candles to the durbar, the tomb-chamber, hundreds of birds suddenly land on the branches of the mursali tree. Little else is heard in the courtyard except for their chirping. As the drummer strikes, the candles are lit amid the chanting of a Persian invocation to Gharib Nawaz, acknowledging him as the foremost friend of God on the face of the earth. 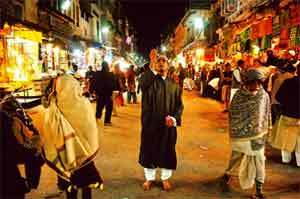 While the aforementioned list might reflect a present-day curiosity for Sufism, throughout its history Ajmer has been a star attraction. The Mughals, particularly, attributed their success in India to the blessings of Moinuddin Chishti. Emperor Akbar visited the dargah 14 times, once walking all the way from Agra. 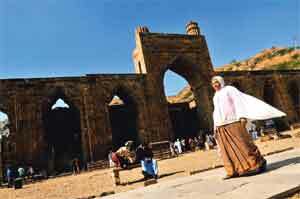 Jehangir lived in Ajmer for almost three years. Shah Jahan built a marble mosque in the dargah. Princess Jahanara raised the marble porch Begumi Dalaan (Begum’s courtyard), opposite the entrance to the durbar. Even the orthodox Aurangzeb, who did not believe in the Sufi doctrine, was seen paying his respects at this dargah. As the winter sun sets behind the barren Aravalli hills, the marble floor gets cold.Qawwals sit facing the durbar; some listeners look lost, others gaze at the dome. Among the devotees, the Kashmiris stand out in their loosely hanging pherans. A woman in a red sari has her hands folded in prayer. She is sobbing. “Before reaching Ajmer”, says Raza Rumi, a writer and political analyst from Pakistan, “Moinuddin meditated in Lahore for 40 days at Data Darbar, the shrine of Usman Hajvery. Gharib Nawaz consequently is cherished in Pakistan and hundreds of Pakistanis visit his dargah.” India issues special visas to Pakistanis for the urs. Fifteen minutes away from the dargah is the majestic Adhai Din Ka Jhonpra mosque situated in the foothills of Taragarh. One of South Asia’s earliest Islamic structures, its outer walls are sculptured with theKalimah (“the word of Islam”). The monument, now overlaid with graffiti, includes crude sketches of peacocks on the stone floor. Indifferent to the discords of the past, goats meander along with pilgrims who stray from the dargah to sightsee. Only a few offer prayers at the mosque here. “The majority of Indian Muslims were Hindus,” says Dehlvi, “and accepted Islam because of Gharib Nawaz and the Sufis who spread his message. The Khwaja allowed his followers to express the love of God through inclusive traditions such as music. This sanction gave birth to diverse devotional expressions that thrive to this day.” The food cooked in the dargah’s giant copper cauldrons, distributed after the morning and evening prayers, is always vegetarian. Rumi says, “The Chishti school of Sufism did not exclude any religion and gave way to a plural Indian identity. This is why the extremists in Pakistan, especially the Taliban, are against such devotional practices.” In 2010, the dargah of Baba Farid in Pakistan, another saint of this Sufi order, was bombed. During urs, the durbar is closed at a later hour. One week earlier, a green and red flag is hoisted on the Buland Darwaza gateway to signal the arrival of the festival. By thenmalangs (non-conformist Sufis), fakirs (ascetics) and qalandar s (non-conformist Sufis) from all over India are midway to Ajmer, walking. They assemble at thedargah of Khwaja Qutubuddin Kaki in Mehrauli, Delhi and from there walk to Ajmer Sharif, a journey that takes 17 days. Though the town gets back its breathing space a day later, the crowd at the dargahnever dissipates. Divided by religions and countries, the devotees of the Khwaja, spread across South Asia and beyond, challenge these rifts each time they come to his durbar. On December 5, The Hindu, a major national daily, reported an important step forward in Indian Muslim relations with state governments. According to the newspaper, authorities in Rajasthan, on India’s western frontier with Pakistan, have appointed representatives of the Barelvi sect, a traditionalist Sunni interpretation imbued with spiritual Sufism, to the leadership of several Muslim institutions. In doing so, The Hindu reports, Rajasthan effectively barred radical Islamist agitators from directing local communal bodies, and has followed the lead of the central government, which is controlled by the Indian National Congress-led United Progressive Alliance. A prominent Barelvi, Maulana Fazl-e-Haq, who is affiliated with the Madrasa Ishaqiya of Jodhpur, will head the state’s Madrasa Board, with responsibility for administration of Islamic religious education. He is a disciple of the aged Sufi Hazrat Allama Pirzada Maulana Chaman Qadri. Hazrat Chaman Qadri, of Gyarwee Sharif Jalsa Bundi, is a leading figure in the Qadiri Sufi order (tariqat), one of the largest and oldest in the Muslim world. Chaman Qadri is also the chief qazi (head Islamic judge) in Rajasthan and a member of the Hajj Committee and other Muslim institutions. The Rajasthan Urdu Akademi, charged with development of Urdu culture among the state’s Muslims, will be supervised by Habib-ur-Rehman Niyazi, from the Barelvi family of Meerji Ka Bagh. The Rajasthan Public Service Commission will now include Indian Police Service officer Habib Khan, a Barelvi. The new chairman of the State Minorities Commission, M. Mahir Azad, is known as a Sufi sympathizer. Previously, Rajasthan had appointed Liaqat Ali, a devotee of a Sufi shrine in the district of Jhunjhunu, to the local Waqf Board, with oversight over Islamic pious foundations. In the analysis of The Hindu, Rajasthan’s Muslim apparatus will not encompass representatives of Darul Uloom Deoband, the fundamentalist seminary in Uttar Pradesh (U.P.) disseminating the doctrines that inspire the Pakistani and Afghan Taliban. Deobandism, imitating the intolerant habits of Saudi Wahhabism, declares Barelvism to bekufr (“disbelief” – literally, “concealment of the truth of religion”), and Deobandis seek to render Barelvis vulnerable to murder and pillage. Deobandis are aligned with the jihadist Jamaat-e-Islami (JEI) movement founded by Abu’l Ala Mawdudi, and Deobandism produced the worldwide Islamist missionary organization, Tabligh-i-Jamaat (TJ). The Rajasthan state government’s naming of Barelvis to Muslim community positions is described by The Hindu as reflecting “an atmosphere building up all over [India]” against Wahhabi extremism, Deobandi influence, and the penetration of their advocates in Muslim institutions. The All-India Muslim Personal Law Board (AIMPLB) has been a particular arena for conflict over Wahhabi and Deobandi intrigues. All-India Ulema and Mashaikh Board (AIUMB) general secretary, Maulana Syed Mohammad Ashraf Kichowchhwi, head of the Sufi shrine of Kachhochha Sharif, in Faizabad. A frontline role in opposing Wahhabi and Deobandi growth among Indian Muslims has been taken by the All-India Ulema and Mashaikh Board (AIUMB) and its general secretary, Maulana Syed Mohammad Ashraf Kichowchhwi, head of the Sufi shrine of Kachhochha Sharif, in Faizabad, U.P. AIUMB claims to represent 80 percent of Indian Muslims, and has called for cooperation between Sunnis and Shias in the Islamic fold. Maulana Kichowchhwi and AIUMB have organized an extensive campaign to expose and condemn Wahhabi and Deobandi fanaticism and the danger it poses to Indian Muslims, the whole country, and all of humanity. In 2010, Kichowchhwi and the AIUMB demanded that Muslims “liberate” 10,000 mosques, madrasas, shrines, and other Islamic institutions in U.P. from Wahhabi-Deobandi control. In October 2011, AIUMB called a mahapanchayat with the participation of 100,000 Muslims in Moradabad, U.P. that underscored the board’s repudiation of radicalism. Maulana Kichowchhwi responded to the Deobandi fatwa prohibiting milad-an-nabi by announcing, “The fatwa is proof that Deoband would like to impose the foreign ideology of Saudi Arabia and Wahhabism on India.” He cited classic Islamic scholars’ evidence that Muhammad celebrated his own birthday. According to Kichowchhwi, Indian Muslims always participated in “Julus-e-Mohammadi” commemorations of the Prophet’s birthday. Deobandi representatives have assailed Rajasthan chief minister Ashok Gehlot and the Congress party for favoring the Barelvis and Sufis. The Rajasthan Muslim Forum, a Deobandi group, alleged that the Rajasthan government seeks to create “sectarian discord” among Muslims, supposedly to conceal the involvement of Congress in communal violence between Muslims and non-Muslims. M. Salim Engineer, national secretary of Jamaat-e-Islami Hind (JEIH), the Indian branch of the Mawdudist JEI, argued that a majority of madrasas in Rajasthan incorporate the Deobandi curriculum. But there as in U.P., the Barelvi representatives say that Islamic schools have been usurped by the radicals. 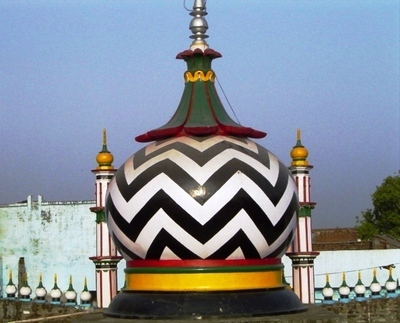 Dargah of Hazrat Ahmed Raza Khan, Bareilly Shareef — Photograph 2004 Via Wikimedia Commons. MSO’s Murshidabad convocation, according to the U.S.-based Indian Muslim news portal TwoCircles.net, endorsed the disapproval of the AIUMB, with which MSO is aligned, regarding the financing of Indian Muslim institutions by Saudi Wahhabis. It appealed for the establishment of a central madrasa board to monitor foreign funding of religious schools; high-quality, modern schools in districts with large minority populations; removal of extremists from waqf administration, and the adoption of legislation governing Sufi shrines (dargahs) to protect and operate them according to moderate Sunni principles. Kichowchhwi extended his criticism of Saudi Wahhabism and South Asian Deobandism to include “Salafis,” who use this title, referring to emulators of the first three generations of Muslims including Muhammad, his Companions, and his Successors, to camouflage their adherence to Wahhabi doctrines. He additionally reproached “Ahle-Hadith,” another term employed in South Asia to cover Wahhabi intentions. Maulana called specifically on the Indian central government to prevent the assumption by any representative of these trends of duties as a chairman, chief executive officer, member or manager of any waqf in India. “They are utilizing Waqf properties to propagate Wahhabism, which preaches hate and intolerance and now has become a threat to the country’s secular fabric,” he said. While Deobandi representatives accuse the Indian central government of using the Barelvis as a counter to Deobandism, AIUMB officials do not profess false modesty – rather, they see the consequential action in Rajasthan state as a product of AIUMB’s committed defiance of Wahhabi corruption and Deobandi extremism. If the Indian central government has decided to assist the Barelvis in shaking the Wahhabis, Deobandis, “Salafis,” “Ahle-Hadith” and other extreme fundamentalists out of Indian Muslim community institutions, that is a cause for congratulation, not complaint, to India’s political class. In the aftermath of the upheavals of the “Arab Spring,” movements for civil society and secular governance in the North African countries have been pushed aside by the Muslim Brotherhood, which allied historically with the Saudi Wahhabis and South Asian Mawdudists, and which triumphed in the recent Tunisian, Moroccan, and Egyptian elections. Further, in a particularly alarming development, a mass Wahhabi formation (using, as elsewhere, the false “Salafi” label), the “Party of the Light” or “Hizb Al-Nur,” received 25 percent of votes in the first round of Egypt’s polling. A similar, if not worse, outcome is expected from the second round of Egyptian balloting, which was held on December 14-15 amid violent protests against the rule of the Supreme Council of the Armed Forces (SCAF). Its results have yet to be released. The “Arab Spring,” with its early, liberalizing idiom, was expected to strengthen civil society in the Arab Muslim lands, and was greeted with considerable enthusiasm by moderate Muslims as well as by Western partisans of democratic change. The effect of free electoral choice in North Africa has so far been very different, to say nothing of the chaos in Yemen, cold stalemate between Sunni rulers (backed by Saudi Arabia and the Gulf Cooperation Council) and the Shia majority in Bahrain, and continuing hideous massacres by the Al-Assad regime in Syria. The “Arab Spring” was believed to herald the end of the cycle of radical Islamist gains that began with the Iranian Islamic Revolution in 1979, and which, outside the Middle East, has devastated Pakistan. Significant obstruction to Wahhabi aggression now appears in the peripheral Muslim communities, including the Balkans no less than India. Calling itself “the world’s largest democracy” and possessing the third largest Muslim population in the world, India has produced a stiffer resistance to radicalism than any of the lands of the “Arab Spring.” If Egypt and Syria are bulwarks of extremism and tyranny, Indian Islam may provide a barrier to jihadist ambitions. With their widely-respected intellectual heritage, their close link with spiritual Sufism, and their demonstrated loyalty to India, the country’s Muslims have shown the world that Western governments are wrong to accommodate radical Islam. Now we hear in the U.S. and Britain, from government in the first instance and media commentators in the second, that the Muslim Brotherhood is “moderate” in its program and that the so-called “Salafis” in Egypt are merely “conservative.” Ordinary Muslims from the Balkans to Bengal have expressed their disagreement with this benign view. India need not repeat a mistaken strategy of accommodation to the Wahhabis and their disciples. Maulana Kichowchhwi and the AIUMB deserve the strong backing of India’s moderates and non-violent religious conservatives, Muslim and non-Muslim, in confronting the encroachments of Islamist zealotry. The effect of religious and political hindrance to the Wahhabi “revival” will be felt throughout the large Indian Muslim diaspora, and its example may be seen and equaled by other Muslim communities, as well as Muslim and non-Muslim governments. The decision of the Rajasthan state government, which, on the Pakistan border, faces a risk greater than in U.P. or West Bengal, is especially important. A struggle that may have been lost in Egypt and Pakistan may be won in India. And as India’s Muslims go, so may the entire ummah develop in its relations with secular governance. 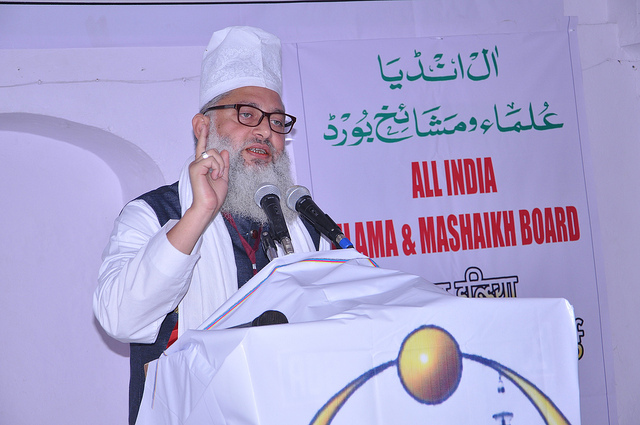 Lucknow Jul 01 (Only Kashmir/TCN): The Wahabi/Salafi fire that has engulfed Afghanistan and Pakistan will not be allowed to burn India, said Maulana Syed Mohammad Ashraf Kichhowchhvi addressing eighth annual meeting of All India Ulama and Mashaikh Board (AIUMB) held today at Rudauli. Kicchhowchhvi who is the president of AIUMB said in addition to importing oil from Saudi Arabia, India is also being a recipient of the Wahabi ideology. “This ideology is detrimental to our internal security, national harmony and ethos,” argued Kichhowchhvi. The AIUMB board has long demanded removal of Wahabi caretakers of khaanqaahs and dargahs. 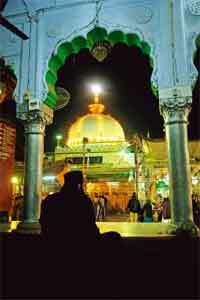 Gaddinasheen of Khwaja Moinuddin Chishti Dargah in Ajmer Syed Mehdi Miyan Chishti said that Sufism has deep roots in India and the conspiracy to weaker it never be allowed to succeed. “Devotees from all over the world come to Ajmer because they have deep respect for Sufism, some people are trying to attack the devotion that people have. This is not just an issue of Indian Sunni Muslims but an issue that affects the nation and the humanity,” said Chishti. Board also objected to the visits of Imams of Harmain visits to India. They said Imams are being used to setup an extremist Wahabi leadership in India. AIUMB’s Uttar Pradesh’s president and Sajjadanasheen of Khanqah Rudauli Shareef Shah Ammar Ahmad Ahmadi Nayyar Miyan demanded adequate representation of Indian Muslims in state government’s policies. Board’s Mufti Syed Waseem Ashraf said India should be cautious about her relationship with Saudi Arabia. Board also discussed and approved a draft will that can be used by Muslims who want to give their property to waqf. This will have provisions to make sure that Sufi practices continue to be performed. Others who participated in the meeting were Syed Shahid Chishti from Ajmer, Qari Ayub from Muzaffarpur, Maulana Noorani from Srinagar, Haji Yunus Solanki from Vadodra, Syed Faraz Ahmad Aamri from Delhi. A Muslim Sufi organization has pledged its fealty to Prime Minster Narendra Modi. The All Indian Ulema and Mashaikh Board (AIUMB), has pledged to work with the Prime Minister on countering terrorism and eradicating extremist ideology from the country. 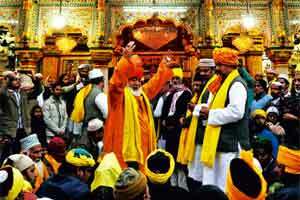 Kichhowchhawi had led a team of about 40 Sufi clerics, who interacted with Prime Minister Narendra Modi. The PM had told the delegation that ideology propounded by Sufi saints was integral to Indian ethos but forces of extremism are trying to weaken it. He had asked them to counter such forces through various avenues including on social media, so that the ideology of extremism does not take root in India. After the meeting the AIUMB was all praise for the Prime Minister and claimed that none of the other previous leaders of the country have never truly realized the potential of Sufism. “Those who ruled the country and for whom we voted traditionally never cared for our issues. This is a ruler who got the seat without our votes and is still listening to us. He does not need us. He does not look at everything with an eye on the votes,” Kichhowchhawi said. The AIUMB told the PM that they don’t want people to create a divide between communities just to increase their own vote bank. The PM has assured that necessary action will be taken and he will also address the nation’s Muslims in his next ‘Mann ki Baat’. 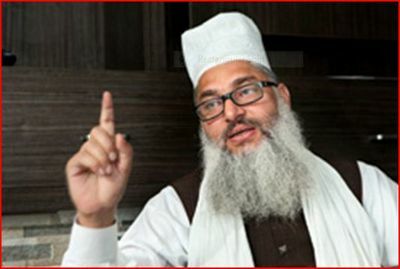 New Delhi 21-Feb (RINA): All India Ulama & Mashaikh Board beliefs that the hidden belief of wahhabi/Salafi ideology has got its expression in the words of Mufti Ilyas patron Jamiatul Ulama-e-Hind Gonda unit, who has said that Shiva is first messenger of the God He has emphasised over the issue by saying that it is not his idea but he beliefs in that Shiva is the first messenger sent by god. President and founder of AIUMB Hazrat Maulana Syed Mohammad Ashraf Kichhochhawi said in a statement that it is the turn of Indian Muslims to realise the sensitive nature of statements like one from that Group of Muslims who have hijacked Muslim representation and are supposed to represent the community in political class and corridors of power. AIUMB has been constantly saying that we do not believe in religious or political leadership of these elements who are led and fed by gulf oil money and are working to propagate a dangerous agenda which is bound to create social disharmony and religious discord. President AIUMB said that these wahhabi/Salafi elements have gained access to places where they are given space to propagate their ideology and they are doing this fearlessly. He also said that statement of Jamiat-e-Ulama leader needs to be scrutinised that All the Indians are one blood; they belong to the same religion. Jamiat leader Mufti Ilyas says that all are Sanatan dharmi and Hindus, which has no basis. AIUMB is of the opinion that Jamiat e Ulema E hind has taken the route of R.S.S with which it has been in constant contact for years and now they have realised that the time has come to pay back. AIUMB strongly objects to the idea presented by Jamiat Mufti because it is an attack on the religious beliefs of Muslims all over the world. AIUMB regards Shiva, a great persona in Hindu Mythology and his effects on Hindu society, but religiously speaking his elevation to the first prophet by one non entity like a Jamiat Mufti demands immediate action. Mufti Ilyas must be arrested and put behind bars because he is propagating disharmony in Indian society and also violating Islamic believes for no reason whatsoever. New Delhi: Hundreds of religious scholars from India, Morocco, Bosnia, Chechnya, Pakistan, UAE and Syria –including those from the Shia community are expected to take part in a 3-day conference titled “International Sufi Conference” beginning 5th March, 2015 in Delhi. He said it was the first time that an Indian Sufi Sunni apex body of Muslims, Ulama & Mashaikh Board (AIUMB) had gathered millions of mainstream Muslims and intellectually demolished the ideology and theology of Al Qaeda and like-minded groups. An apex body of Sufi Sunni Muslims in India, All India Ulema & Mashaikh Board (AIUMB) hosted a special meet in its central office at New Delhi to discuss the issues of extremism finding ways to work out effective counter-narratives. With a number of Sufi-minded Islamic scholars, writers and journalists, university students, social activists and grassroots workers, the event was aimed at finding newer ways of spreading the Islamic message of peace and tolerance as a counterattack on the ideological extremism that seems to be growing faster in India too. 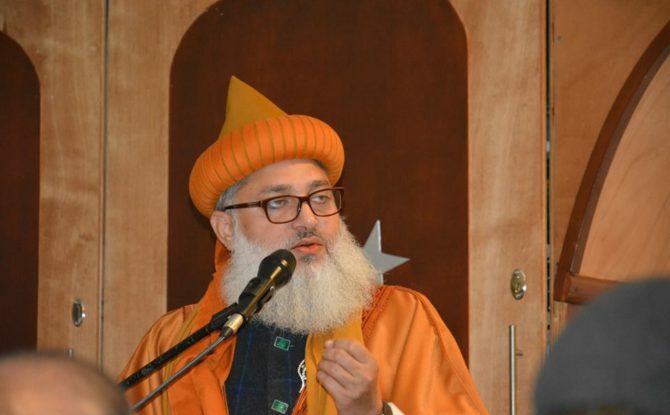 Maulana Abdul Moid Azhari, secretary (AIUMB) said that Islam is being wrongly identified with terrorism which has no ideological link with peaceful sufi doctrines. 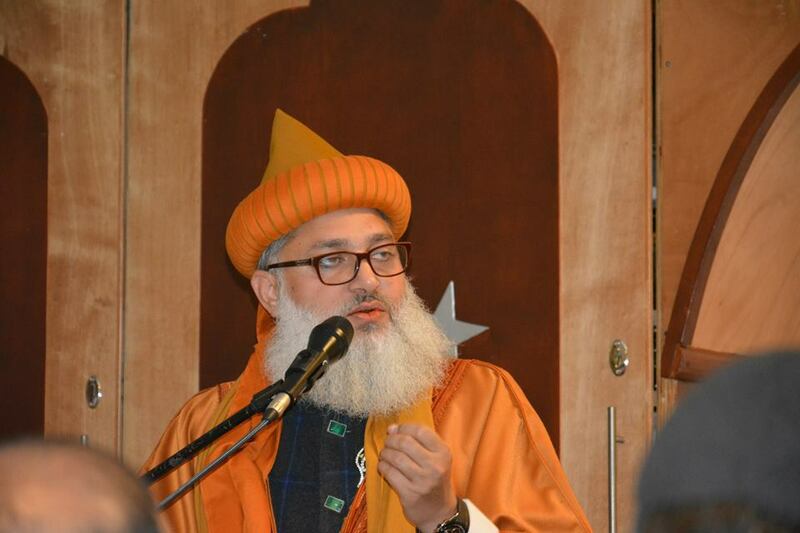 “Sufi ideology is based on peace, brotherhood and tolerance through which the message of peace and harmony is being circulated to the entire world,” he said. The venue of the event has been decided at Delhi’s Ram Lila Maidan.